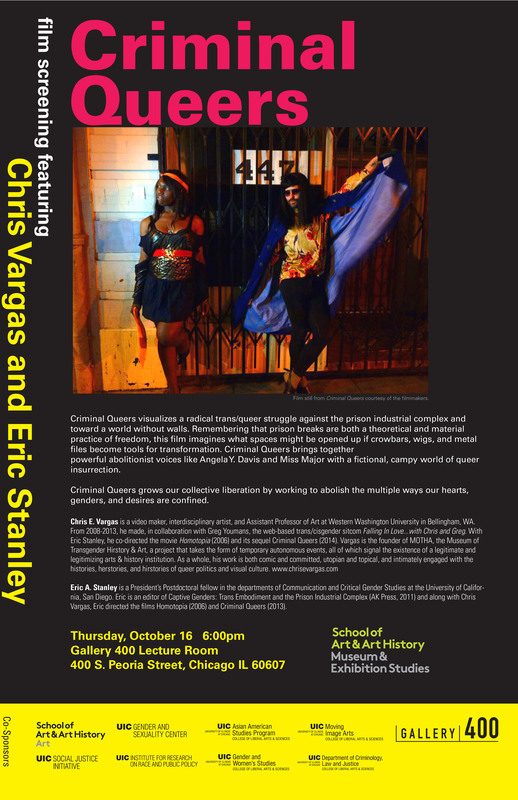 As part of “Material Conditions: Gender, Sexuality, and Capitalism” I’ll be giving a keynote, “Blood Lines: AIDS, Affective Accumulation, and Viral Labor” on Friday March 13, 2015 at 7pm, Lewis and Clark College in Portland, OR. The conference is free and open to the public. I was lucky to have been a part of two historic panels featuring the brilliance of CeCe McDonald, Reina Gossett, Janetta Johnson, and Miss Major. The audio link for the “Futures of Abolition” panel at the ONE Archive in LA is here, the video for the event at UCSD is here. In other news, Kameelah Janan Rasheed recently interviewed me for a piece called The Carceral State which appeared in the California issue of The New Inquiry. Here we talk about prison abolition, Prop 47 and how prisons produce the fiction of binary genders. 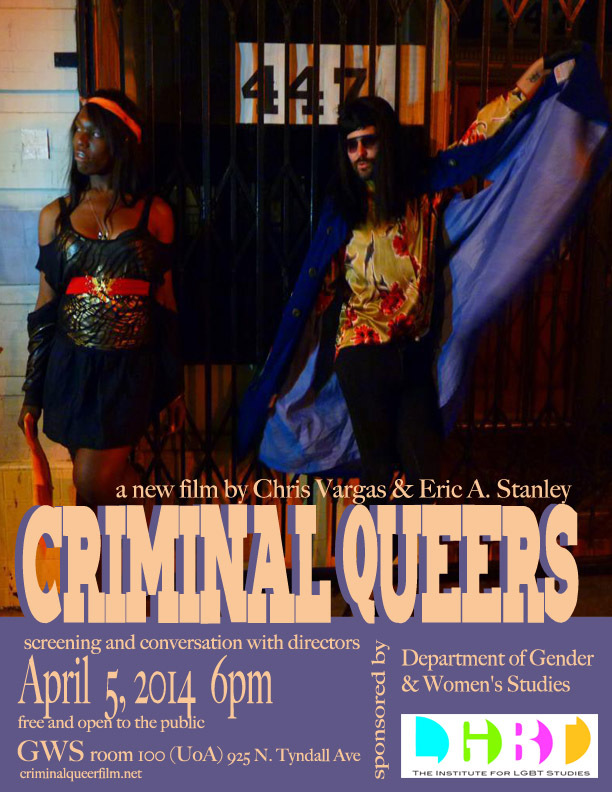 Chris Vargas and I will be in Chicago at UIC on Thursday October 17th for a screening of Criminal Queers. 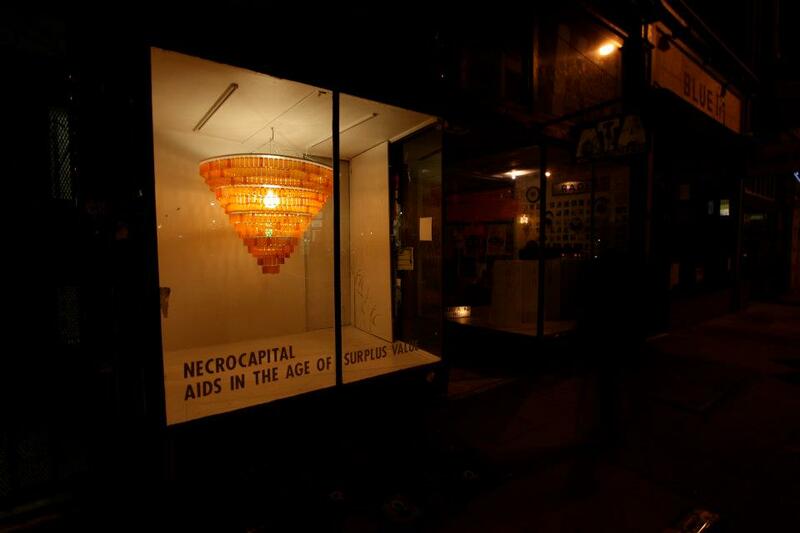 The event is at 6pm Gallery 400 Lecture Room 400 S. Peoria Street Chicago, IL. As always, the event is free and open to everyone. 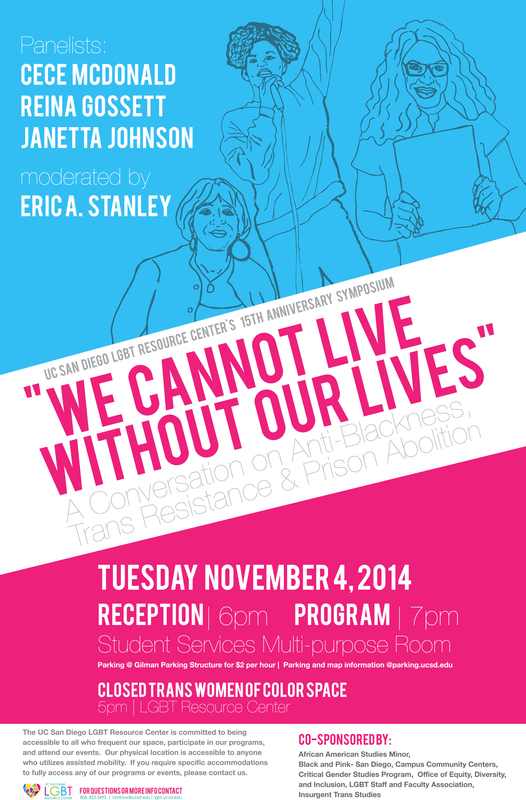 On Tuesday November 4th I’ll be in conversation with CeCe McDonald, Reina Gossett, Janetta Johnson, for the event “We Cannot Live Without Our Lives: A conversation on Anti-blackness, Trans Resistance and Prison Abolition” The event is from 7-9pm at UC San Diego Student Services Center Multipurpose Room. I’m looking forward to being part of the keynote panel along with Patrick Anderson and Dylan Rodríguez for the Foucault and Madness conference Sept 26th, 2014 at California State University San Marcos. We are proud to present a keynote panel that is diverse in its knowledge about police, surveillance, and incarceration. Given their research into racist state violence, hunger strikes, and the treatment of incarcerated trans and queer bodies, these seasoned scholars will be tackling the central prison-industry-complex issues of our day, including: the elimination of spaces for protest, police tactics and norms, and the “best practices” of privatizing police. My hilarious and brilliant friend Reina Gossett (who is also a contributor to Captive Genders) along with Sasha Wortzel are working on a new film called “Happy Birthday Marsha”. If you can, please help support this project! 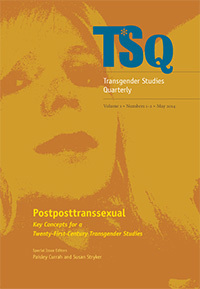 The inaugural issues of the journal TSQ:Transgender Studies Quarterly was just launched in which I have a short keyword for “Gender Self-determination.” My piece is available to download as a pdf here. I was also recently a part of a roundtable for Public Books on the show Orange is the New Black. My contribution “Abolition and Trans Resistance” thinks about the political possibilities of our moment while still wanting more than only representational change. Finally, Toshio Meronek and I wrote “Unintended and Anti-Social Consequences of Social Media Use” for truthout about social media and the catastrophic consequences for the Bay Area. The lovely Chris Vargas and I are headed to Arizona for three days and three screenings.